-BROKE-N-BLUE- from Kolsva, Sweden, is a studioproject with members from different bands playing the original music of Lars Abrahamsson. Lars arranges and plays guitars and keyboards, and sings backing vocals. Eva Abrahamsson and Peter Gustavsson sings lead and backing vocals. Lars and Eva have been playing in bands for 20 years and joined the same band for the first time about 15 years ago. Peter is guitarist and leadsinger of a party/coverband called SIXPACK from Arboga, Sweden. For the debut-album, Ulf Vestlund joined on bass/drums. Ulf is bass-player in top coverband DeSotos and plays with wellknown artists as Carola, Jill Johnson, Jennifer Brown, Andreas Johnson and Tityo. BROKE-N-BLUE- is one project among others, and this project is meant to put together Lars new songs in the style of AOR/melodic/westcoast/FM-rock/guitarrock etc. Lars started out playing drums in the late 70's and went on with other instruments as he joined different bands in the 80's. He's been writing songs for a long time but never sent anything to the record companies until 1999. He writes in a variety of styles, pop, rock, blues, ballads etc. In 1985 he met his wife Eva who had been playing keyboards and singing in some local coverbands. Together they joined some bands 86' to 92' (TRAUMA, TAKE COVER, DISTANCE among others) and later, Eva has primary been playing at home, recording songs in their homestudio together with Lars, and he's been playing with the band CROSSROADS. In 1996, Lars met Peter, singer/guitarplayer of a cover/partyband SIXPACK, and joined as stand-in on different instruments whenever vacances occured.Peter has been playing since 1982 and joined a lot of cover/originalbands. In late 80's he made two singles with melodic hardrockband Angelize and after that he's been busy working with SIXPACK. In 1999, Lars wrote "Heaven in my hands" as a powerballad to see how Peters voice would fit this style. Very pleased with the result, Lars went on writing new material to see if they could put together a new project in the westcoast/guitarrock-genre. The song was sent to a contest in the Swedish magazine MM (Musicians Magazine) and got a "mention of honour". 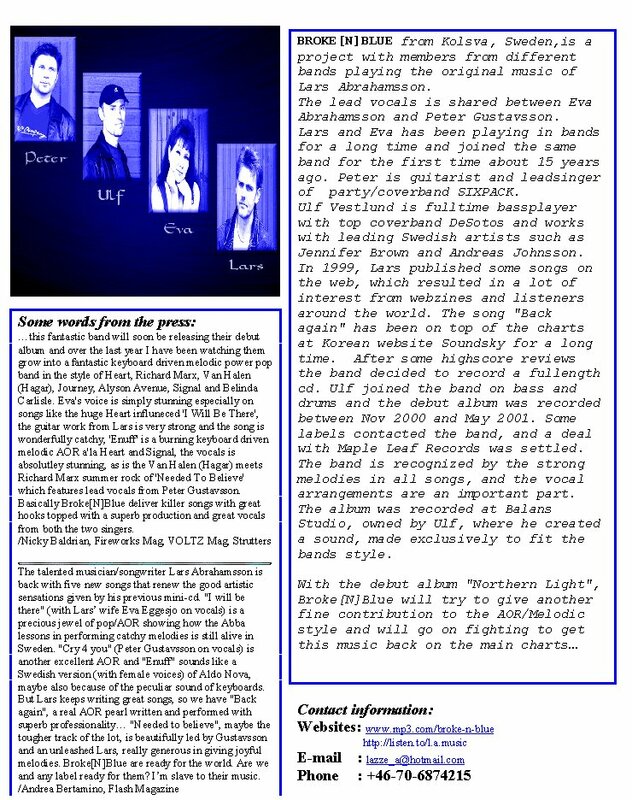 For the next issue, Lars sent "Heavenly beauty" and the song reached the final. Ulf Vestlund joined the project on bass and drums, and the work with a fullength cd started in Nov 2000. 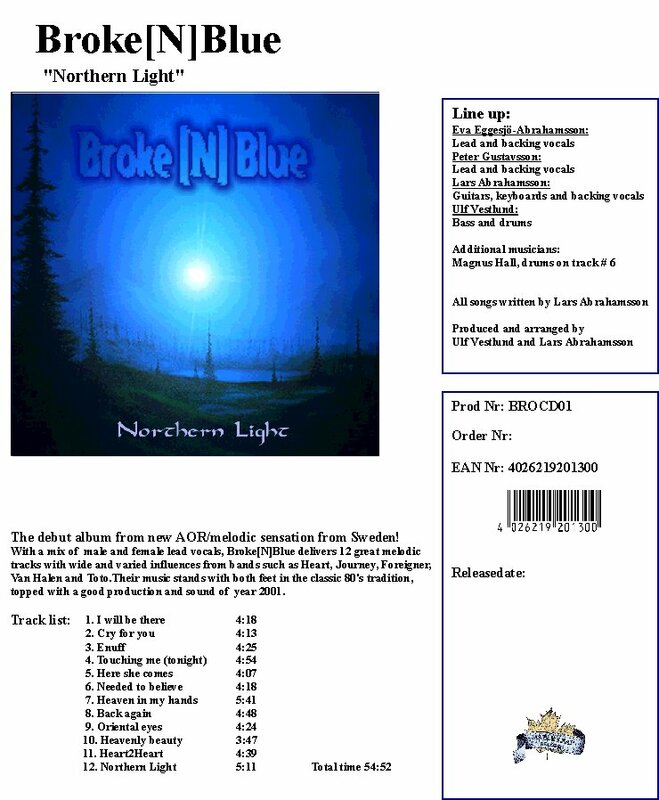 In July 2001, the cd "Northern Light" was released on Maple Leaf Records . Mailorder Worldwide by HangLoose, Target Records ,MusicbyMail etc in Germany . For distribution info in Germany, Austria, Switzerland contact Maple Leaf Records. If you can't find it, contact Lars for ordering info . A lot of great reviews has been written so far, read them in the Press-section.